Four new tracks released online. It’s been a while since Bill Harkleroad released any new music. Not since 2001, in fact, when We Saw A Bozo Under The Sea was issued. 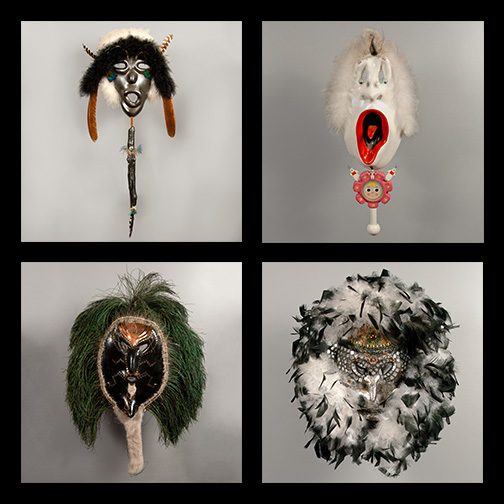 He has just resurfaced, along with a revamp of his website, with four new instrumental tracks each one based on a mask sculpture by Roger Evers. An interesting concept! Can you tell us some more about the masks and the artist who created them? My friend Roger Evers and I have been friends since 1977. We have lived in the same places so we have a lot in common. He is a multimedia artist, poet and painter. To get more information on how the masked were created, check the links to his website below the masks on my website. How did you get involved in creating these tunes for the Masks? When I saw the masks, they had a lasting impression on me. I had been looking to other sources for inspiration, so I asked Roger if I could have some on loan for the walls in my studio. Since then, they are staring me in the face. As soon as I felt them musically, I was on the way. It completely puts me into a space that is much easier to hold onto. I have been creating music for multimedia presentations and a couple of documentaries and liked the process of having something to tell me what to write/play. It is a different kind of challenge. How did you go about creating each piece, do you have a particular process you follow when composing? It was all about what each mask projects to me. Mask #1 – Scary and I don’t speak his language so I have to watch him dance. Mask #2 – So happy you have gone way too far to … ? Mask #3 – Ancient, when goats and virgins were sacrificed. Mask #4 – New Orleans voodoo dancer. Maybe what is cohesive about them is where humans go…maybe just the fear of death. Yes, but I’m still paying off recording costs from the last project. Once that happens I can gather the players, studio and engineer for the next one. Labor of love yes, work for debt, no. Is there likely to be another ZHR album or will you continue to release material on download instead? It seems albums (CDs) are mostly a thing of the past. I think I will burn signed CDs through the website. I am liking the idea of smaller chunks rather than an hour plus of one concept. It seems more flexible. We’ll see, it has to sell enough to move on to the next one.